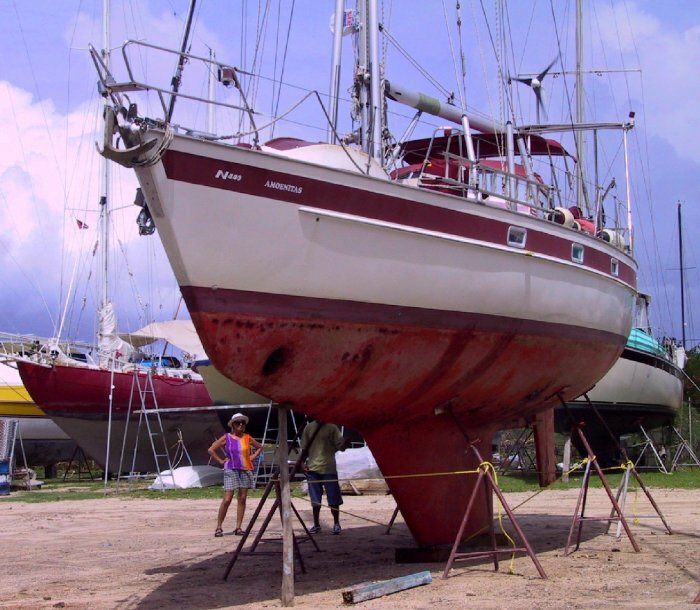 Amoenitas is ready for sea again and we are itching to be on our way west to the Panama Canal and another ocean. The refit went well, being much less complex than last year's marathon effort and so enabled us to concentrate more on improvements rather the repair or replacement of existing equipment. After our long and sometimes arduous return voyage to Cuba, we now feel ready to face the demands of the Pacific and another long passage to New Zealand which we expect to reach around November '02. Also, after two years exploring the Caribbean we are now keen to move on. Psycologically, this Sea is beginning to feel like a shrinking pond! Here we are hauled out at Power Boats just a week before we returned to England for the first time since we set out over two years ago. Life 'on the hard' in Trini can be physically uncomfortable with daytime temperatures around 34ºC coupled with humidity close to 100%. However, there are numerous compensations as there are so many of our friends here, that, after a hard day's toil, the social opportunities are immense. Its also a great place to get all the bits and support we need to keep a complex vessel at sea. The other thing is the friendliness of the locals and the wonderfully rich culture of music and cuisine. Our first visit back home was made easier by the heatwave of late July and we slipped back into our UK lives as though sailing distant shores was on another planet. Our first impressions of England after we landed was how tidy and organised everything appeared and particularly how much more complex the infrastructure was. We had arranged to stay a month, thinking we didn't want to get under everyone's feet but at the end of the day found it woefully inadequate. There were so many people we wanted to see and so many offers of hospitality that we could easily have spent three months there. You can't escape without one image from THE WEDDING. 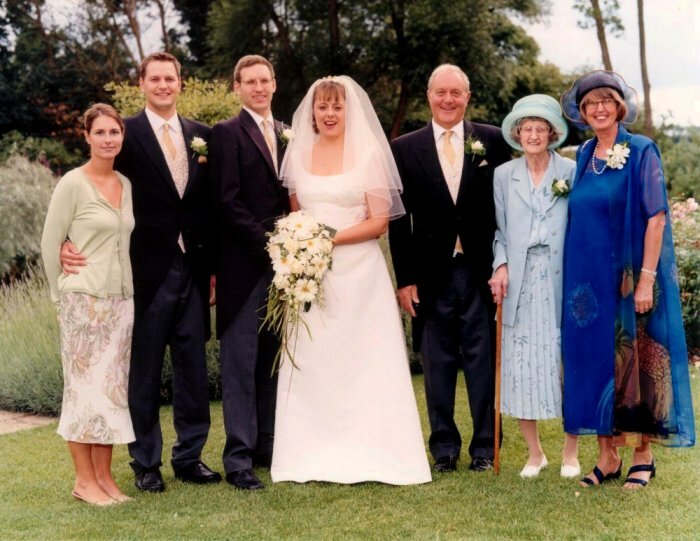 To the left of Bruce and Tracey is his brother Paul, who was best man and his fiancée Emma. We have Di's mother, Kitty between us. Yes, Dave feels as uncomfortable in that get-up as he looks. Clothes are something we are happy to do without! It was a truly magnificent occasion, held at Sopwell House just north of Watford and was a splendid opportunity for us to see many of the extended family together and to meet so many of the happy couples' friends. Dave really enjoyed the Stag Bash in Manchester the week before and even managed to come through the paintballing experience relatively unscathed. That was a great weekend too but as is the way on these occasions, reputations are won and lost, but mainly lost (Gavin!). One of the more difficult re-adjustments to life back in England was getting enough sleep. Out here in the tropics the sun goes down at 6pm every night, so unless there is something special on, we tend to be abed by half past 8'ish. The demands of Stag Bashes, Weddings and numerous social occasions left us reeling and longing for the simple life. 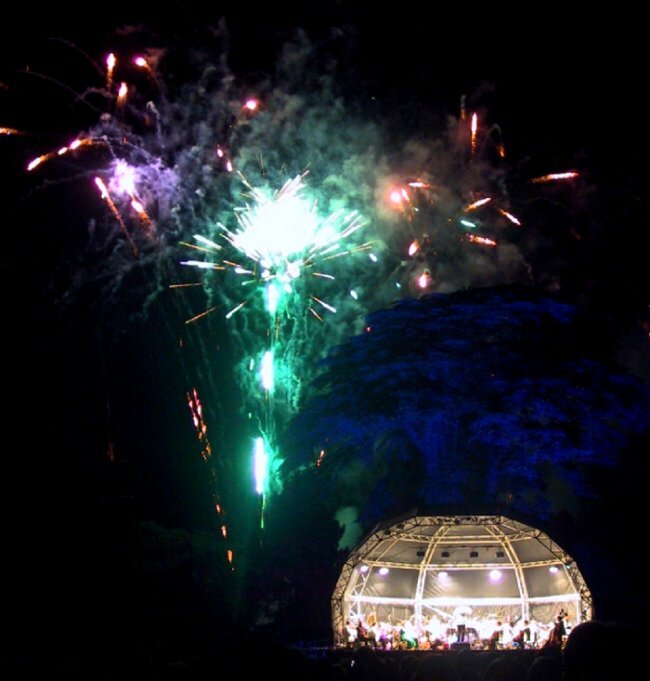 One event that it was definitely worth staying awake for was an extravaganza of music and patriotic exhibitionism at a Prom concert given by the Bournemouth Symphony Orchestra in the grounds of Broadlands, one of the local stately homes in Romsey. It was built by the Palmeston family (an ex-Prime Minister) but is more recently famed as the home of Lord Mountbatten and the place where Charles and Diana spent their wedding night. We were there with a large party of friends from Wellow, complete with folding table, candelabra and a banquet to die for. Definitely a night out to remember. Back now to things maritime. We mentioned in our last update that we have become aquatic creatures, being equally at home on or under these warm, clear tropical waters. We also mentioned that Dave's many dives around Tobago had generated lots of fishy images. 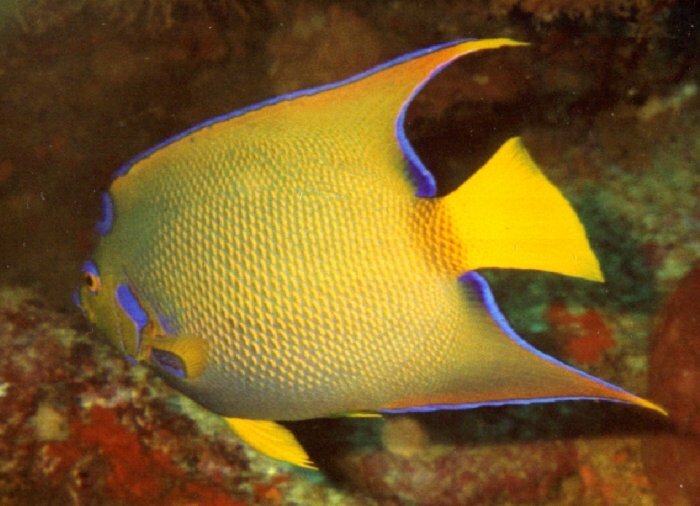 One specie we would particularly like to share with you is the Angel fish. They come in a number of variants, three of which we have examples to show you. 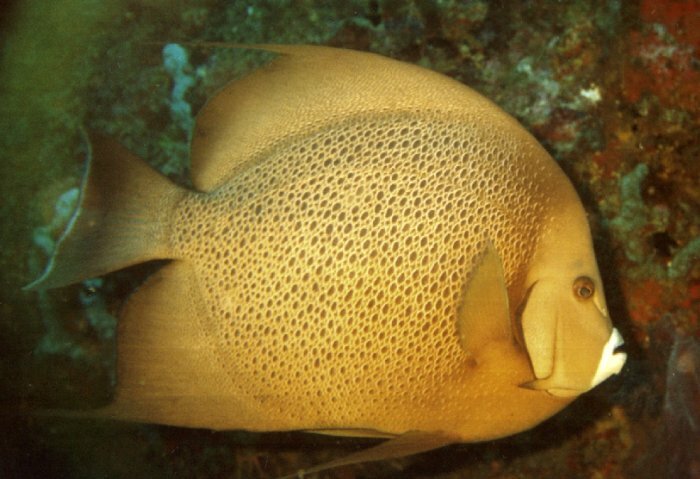 The one below is the French which is typically around 60cm (2ft) long and often seen swimming in pairs. Generally they are pretty tolerant of divers so getting a picture like this with scuba gear is relatively straightforward, provided you can frame the subject at the right range (no mean feat usually). Here is the more rare Grey variety, physically almost identical but for the markings but more light brown in hue than grey. These pictures are taken with a Reefmaster which is a relatively simple, automatic 35mm camera, with an underwater compensated flash, housed in a robust yellow plastic housing, good to depths of around of 50m. Experience has shown that capturing fish on film is easier when scuba diving than when dashing down under with snorkeling gear. They are relatively relaxed with a diver close but are usually disturbed by the noise of exhaled air. Photographing fish in holes or caves is generally easier as they tend to stay put but getting the right angle is generally more problematic. 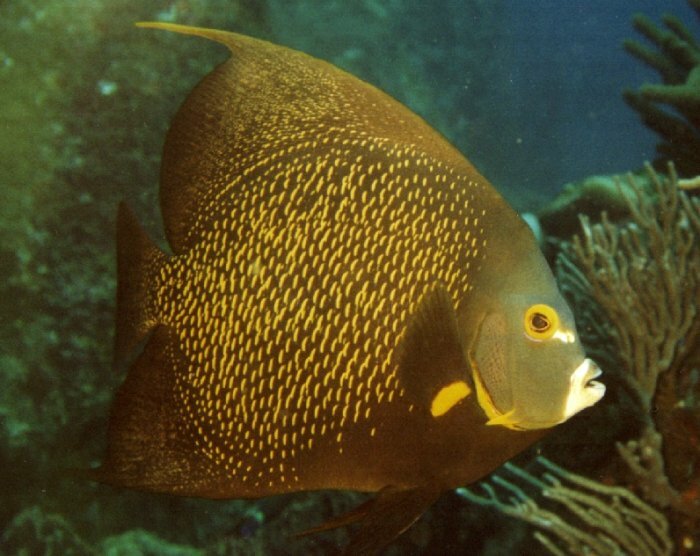 Perhaps the most dramatic example of the specie is this Queen Angel Fish. The colouring is dramatic but getting close enough to get a half decent picture demands a lot of patience and luck. All three images were from dives to around 25m (80ft) where there is still plenty of light for vision but not enough for photography without flash (note the shadow). That's enough of past exploits. We look forward to reporting next on our 1100 mile trip west towards the Panama Canal. This will mainly be via the off-lying islands of the Venezuelan and Columbian coasts. Hoods and drug barons permitting the next update will be from Cartegena, Columbia where we plan to spend Christmas. 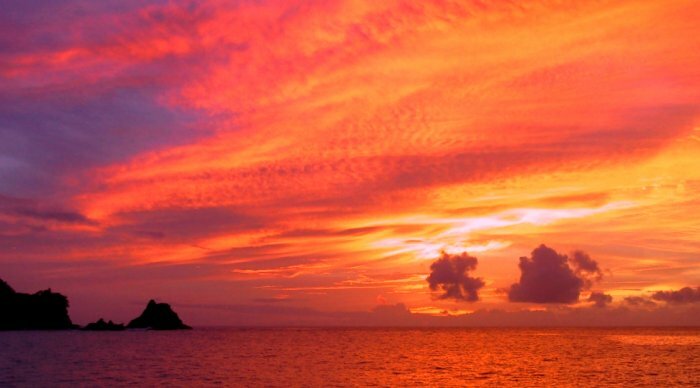 Meanwhile we leave you with a Caribbean sunset from one of our favourite bays on Tobago. Before us is a new and exciting prospect. After two years in the Caribbean we are about to switch Oceans and begin a long trek across the Pacific. First we look forward to renewing our acquaintance with the outer Venezuelan islands (Margarita, Tortuga, Los Roques and Aves). Then on to the ABC islands (Bonaire, Curacao and Aruba in the order we will visit). The plan is to do some serious diving in Bonaire and get to Cartagena in Columbia for Christmas, then move on to the charming, remote San Blas Islands off Panama early in the New Year. This puts in a good position to transit the Canal around Feb/Mar 2002. Once in the Pacific we have a 700nm sail to the Galapagos Islands which straddle the Equator. Then a 3000nm passage into the South Pacific, heading for the Marquesas in French Polynesia. Onward then to a mass of magical island names, like Tahiti, Bora Bora, the Cook Islands, then to Fiji or Tonga where in about October we will make the difficult 1000nm passage to New Zealand.